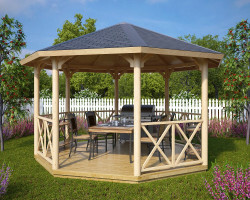 When we are talking about beauty in your garden, there is nothing that can beat a well-decorated wooden garden gazebo. This thing of beauty can be used in many different ways. Wooden garden gazebos and pergolas are perfect for outdoor hot tubs, for garden dining and BBQ’s as well as for many other outdoor activities. Our wooden garden gazebos and pergolas are among the best you can find in the UK. 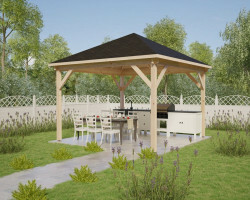 They are made of the finest Nordic wood and coming with strong 120 x 120 mm uprights (posts), foundation beams, prefabricated roof and floor elements, balustrades as well as with a roofing felt. 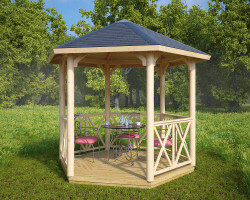 In our range of wooden garden gazebos, you can find small hexagonal gazebos and pergolas as well as large octagonal gazebos up to 15 m². To protect your beloved garden building and make it last for years, we recommend Remmers decorative wood preservative stain. 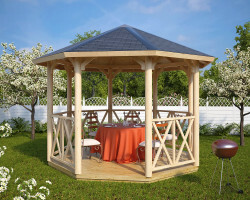 One of the best ways is to paint your wooden gazebo or any other wooden garden building in your favorite colour, and keep the natural wooden look. Don’t forget to have a look on our choice of premium roof shingles. You can choose among several colours and styles. 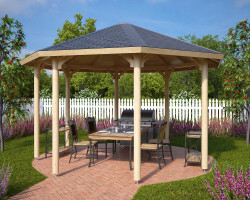 Select the perfect roofing style for your garden gazebo. Colours, roofing, and decorations are extremely important details in achieving the best final result. 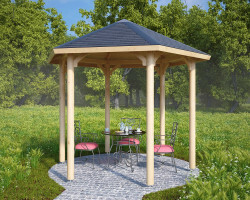 Crown your garden with the ultimate wooden gazebo. 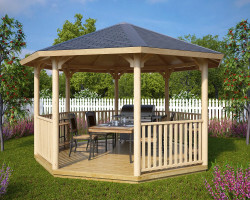 All these wooden garden structures are quick and easy to assemble. 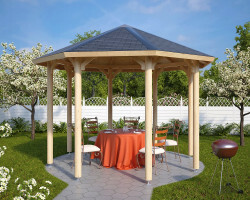 Most of them are a one or two-day DIY project for two persons to build your own wooden gazebo.